. :: The Perils Of Show Jumping Sport - 29 ::. Well, it is that time of the year again when everyone is looking forward to the New Year and its hopes and dreams which await us on the other side of that change of year. However, I thought I would just take a quick look at what has been a funny year for us all at sycamore stables - a year of sadness, happiness, incredible highs and plunging lows. It was with incredible grief and sadness that our 2015 year began with the loss of a beloved member of our team Kay who passed away right at the end of 2014. Our first sad task of 2015 was to arrange her burial; it was a beautiful service though as we all came together on top of a hill surrounded by peaceful countryside as we laid her to rest. We promised Kay we would try our best to make her proud and the next month was spent gathering together all the horses to get them ready for the first tour of the year - Vilamoura, Portugal. Of course being the Wkd team it would not be us if we could not cram a few other things in as well - and it was to Abu Dhabi that Sumas Zorro headed on the way, to make her First Nations cup appearance of the season for Egypt - jumping an amazing clear round to help the team end up an astounding third place in a really competitive Furusiyya Nations Cup™ class- it was just so unfortunate that this was the teams’ only chance at Olympic qualification which went to the super strong Qatar team. Surely with so many teams now competing at such a high level, it's time that this region had more team places available!! We headed straight from there to Vilamoura which was as usual a fantastic time for everyone with the Moura family and all their crew making the show a happy one for everyone and some good results were achieved and many new friendships formed!! It was around this time that news came through that our beloved WKD pepper pot had been successfully sold to Artisan farms owners the Zeiglers. We had sent her to Florida at the end of January to be sold and this was the bittersweet news we had been waiting for. Much as we love our horses they are all for sale and we are so proud of pepper and all she has achieved and know she would go on to fly the sycamore flag high in the states for us. From there we went to France were I managed to win my first CSI 1*Grand Prix with Vera in Palasieu and Sam was so close to making it a double for the team nearly winning the 2* with Zorro but an unlucky rail just kept him in third. It was the following week in Balmoral though that the two of them were finally to get their first Grand Prix win of the year - winning the CSI 2* to a cheering home crowd - it was an incredible experience for us all to win on home ground with the show being twenty minutes from sycamore stables and it was fair to say that there was a lot of pressure on Sam s shoulders as he rode into the jump off - with our sponsors Joe and Pat Sloan being there to clap and cheer them on. Our next big trip of 2015 was what has become the highlight of our season - spruce meadows! This year, we took seven horses between me and Sam, this number reflecting what an amazing series this is and our commitment to expanding our stable s to reach new markets - we are not shy to bring our horses to where the customers are! Whilst we were there I heard of the passing of my Grandfather and so it was fitting that on what would have been his 93rd birthday that Sam and Zorro achieved one of the highlights of their careers to win the CSI 4* Grand Prix of spruce meadows - what a feeling as they received the huge trophy accompanied by all the pageantry which makes up spruce with mounted cavalry, cheering crowds and cameras everywhere - really a moment I won’t forget. The weeks there passed way to quickly and so we were back on Irish soil, this time getting ready for the prestigious CSI0 5* Royal Dublin show which we had finally managed to get Sam a coveted invitation into. However, there was a slight clause - he had to bring a horse for the puissance! For those who have been living maybe in some colony of the moon for the last few years, and don’t know, the rules of the puissance are simple - basically each competitor takes turns to gallop down to an ever increasing large red brick wall - last man standing – wins, simple! Slight hitch was we did not have a puissance horse! Oh and Sam had never jumped one before. No worries there then - it was bound to go well I assured Sam! Well everyone who knows me knows that I refuse to give up on anything, and with my usual stubbornness, I hit Facebook determined to get Sam a puissance horse! As luck would have it our next door neighbours, the Megaheys, had just such a horse, affectionately known as Socks - so we agreed Sam would jump him, arranged a quick practice at a local indoor and that was that. The day of the puissance arrived at Dublin and I told a rather pale Sam as he entered the great arena to face the mighty wall - "it is quite simple, if you want to get back next year you either have to be very entertaining or win the blooming thing." - Sam being Sam managed to do both! After every successful jump of the wall he headed of on a lap around the arena much to the crowds delight and then promptly jumped 2m20. And for evermore around the streets of Dublin he was met with greetings by the locals "The Egyptian man who jumped that great big wall." - proving the point that in our sport you can win all the medals, championships and Grand Prix - but if you truly want to be remembered you just have to run down to a great big red wall - and clear it! Once all the adrenaline and drama of Dublin had settled, it was off on the road we went again - this time we had a date with the rest of the boys on the Egyptian team at the final of the Furusiyya Nations Cup™, Barcelona! 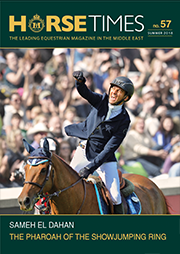 Throughout the year, the Egyptian riders in Europe had been really making a name for themselves; with Karim El Zoghby still very high inside the top eighty in the world, Sam in the top one hundred and Abel Said also sitting very high in the rankings - with their other teammate Mohamed Talaat joining them with his gorgeous stallion Connaught, the guys new that if it all came together there they had a good chance. However for the WKD team the timing was very unfortunate for us, as at Dublin we had been very concerned that Zorro was just not herself, and a resulting blood test confirmed that she was suffering from some sort of virus and her bloods were much stressed. We had thrown her straight out to the field after Dublin, but whilst she was much brighter and better this meant that she was coming to Barcelona a lot less prepared than we would have liked. This was to be her last show of the season we had decided and even though Sam and she were still in contention for the individual Olympic place, we took the hard decision we were not going to chase it - our horse was telling us she had done enough for the year and we were going to listen. Of course arriving at Barcelona, I also had the lovely surprise that having no chef d’équipe there the guys had duly elected me for the role - I must say though that whilst it was not the best timing at the final of the most prestigious series in the world to do make my debut my team were brilliant and I really enjoyed the camaraderie as everyone pulled together as a team. The guys proved that they are fighters and they finished a respectable joint third and if things had gone their way on the day there was only a pole in it from them winning. The future is definitely very bright for the Egyptian team, they have the horse power, the determination and of course an Irish red head behind them - what a dynamic combination... Lol. After Barcelona we headed off to the Moroccan royal tour which was as usual eventful and filled with meeting some lovely people - the MRT committee try so hard to make this tour a success and with just a few changes to the arena surfaces in the first and last show, everything else there is top class - with such enthusiasm at the shows and huge crowds the atmosphere is amazing. And then, we had planned a busy schedule of shows in France and Spain indoors with our younger horses to give them a chance to gain experience whilst the older ones were on a break - however at our first show in Strazeele in France. I, unfortunately, in the Grand Prix had a nasty fall at the double - completely my own fault as whilst approaching it my horse was focused on something at the side of the ring and really was not looking at the large oxer in to the one stride double, I pushed her on to it and she gave such a large jump to try and clear it that I landed up her neck - there was no way she could jump the second part like that and I sailed over the fence to land flat on my back. A wait for the paramedics (just to say, all the Hollywood programmes where they show these gorgeous models being paramedics and in real life you never see this; they are all hiding out in northern France. It certainly made being strapped to a gurney and loaded into an ambulance a much more pleasant experience as I was surrounded by what looked like a troop of male models!) And a trip to casualty confirmed I had managed to break two vertebrae and fracture my sacral joint - but luckily everything would heal well with rest and there was nothing displaced or dangerous. It was a very disappointing and anti-climactic end to the year for the team as there was no point in us continuing with half the team laid up. However, it is hard to keep a red head down and I spent these few weeks enforced break to good use - trying to drum up clients and source new horses for the team. And so from all this we welcome Sam a new speed horse for the season, Chiquito z, the former ride of Scotland's Douglas Duffin, this handsome 12 year old was found by us on a buying trip to Scotland - straight away him and Sam clicked and I managed to negotiate his purchase behind Sam s back as a bit of a surprise! So we reach the end of the year - we have a fantastic string of horses for next season- some very exciting young home bred horses will be joining us on tour and Sam and I are enjoying the holidays before we plan to hit the ground running in January with tours in Oliva, Vilamoura and Arezzo. I would like to wish all the readers of Horse Times magazine and all the staff who have supported us over the last few years a very Merry Christmas and a peaceful New Year.